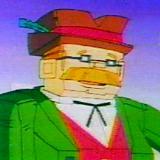 Mayor Squaresly is the mayor of Tetris, a world where everything is made out of blocks and at sharp angles, including the people. Round people rarely visit Tetris due to its distance from most of the video worlds. Mayor Squaresly, like other Tetrads, is extremely fond of holidays and declares a new one whenever he has the chance.